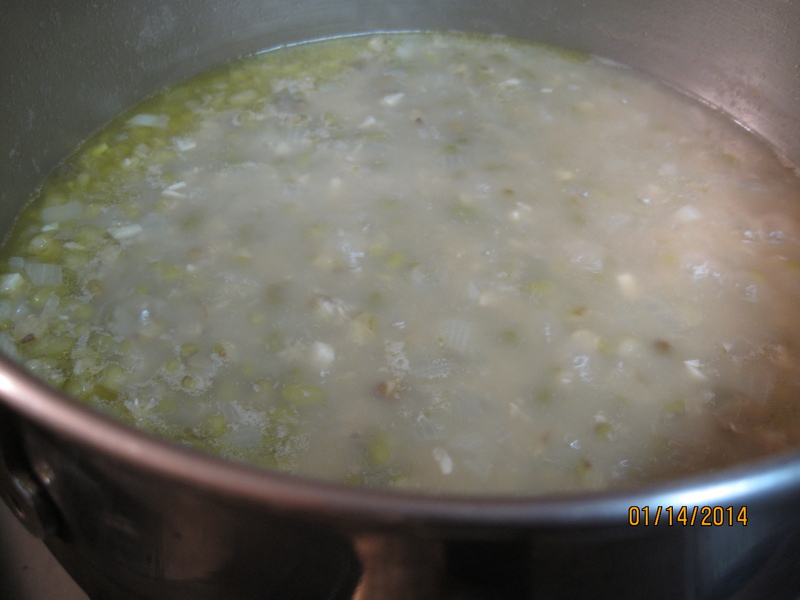 Mung Bean Stew – Who Knew? 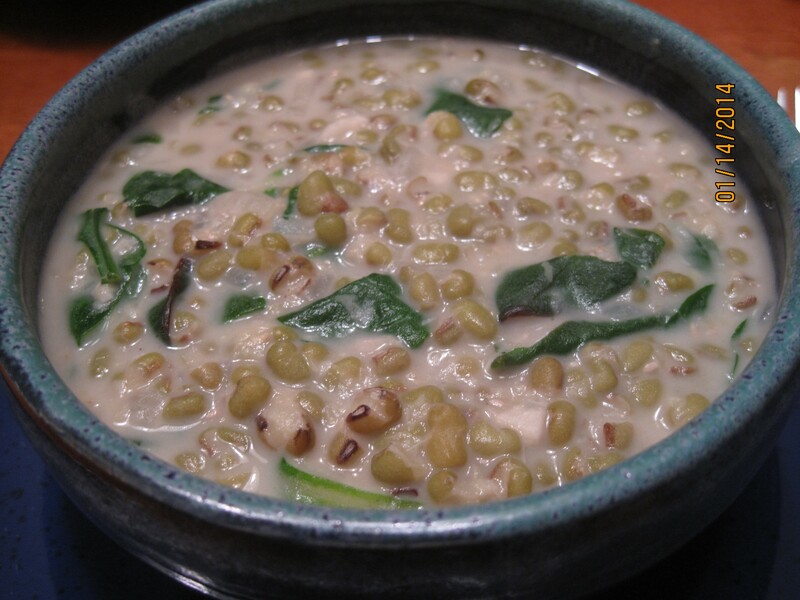 Enter a recipe for mung bean stew on Green Kitchen Stories that floated across my radar a few days ago… “Hey, don’t I have some mung beans in the pantry? I meant to sprout them… ” This, my friends is one of those lovely recipes that is incredibly simple and yields stunning, and winter perfect warming results. I’ve left the flavor profile intact, changed the measurements from metric, and made a few adjustments to the method. 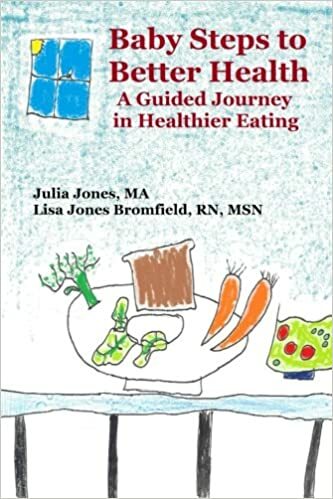 This stew is not to be missed, and Green Kitchen Stories is worth a gander – fab photos and great info. Happy bean stew! 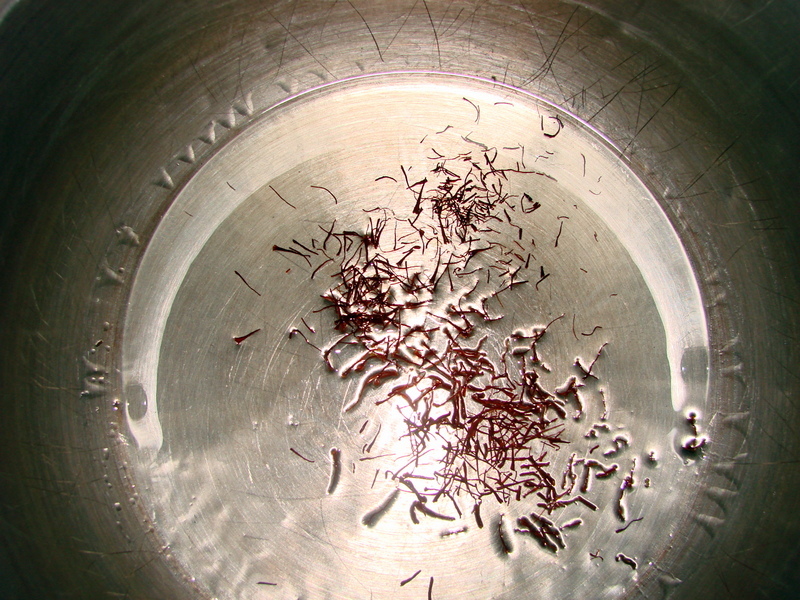 If you need to make rice fresh, start the rice first. Warm olive oil on medium-low in a pan and add the onions. Sprinkle with a small amount of salt and allow the onions to cook for several minutes (at least 5), stirring occasionally to prevent sticking. 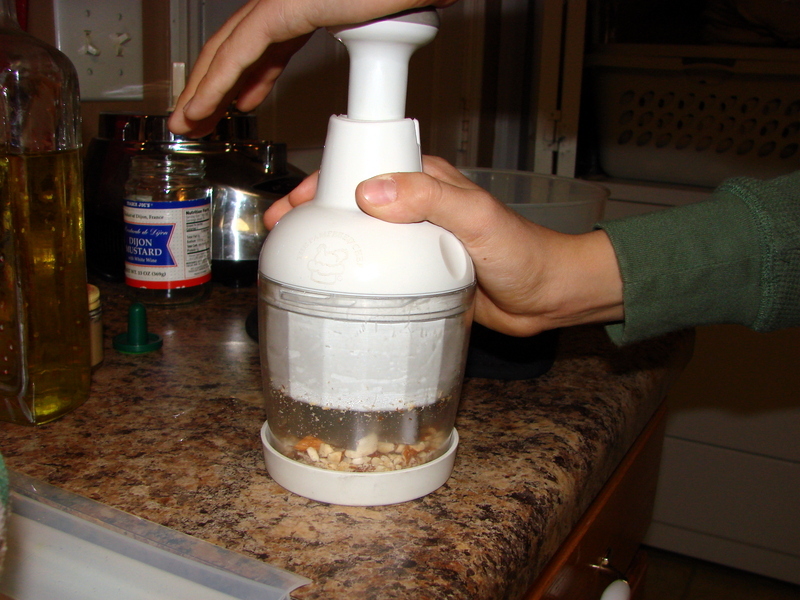 When onions are softened and translucent, add garlic and cumin and cook until fragrant (30 seconds to a minute). 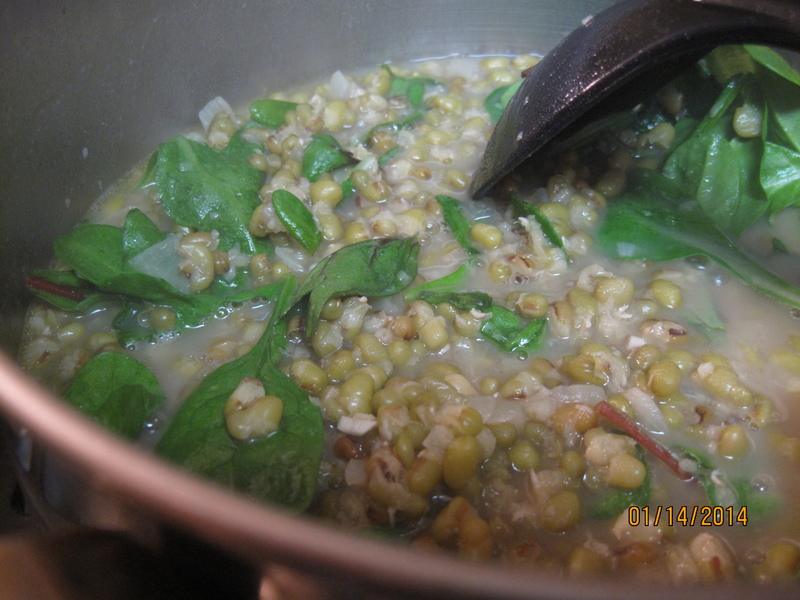 Add water, salt and the mung beans and bring to a boil. Cover and lower heat, simmering for about 30 minutes. Taste to see if bean softness meets your liking. If the greens you’re using is of a less tender variety (like kale), add it now and cook for a few minutes to wilt in the soup, then add coconut milk, remove from heat, and stir. If you’re using a tender green (like baby spinach), add the coconut milk first, keeping soup on very low heat, add greens, stir and cook for just another minute to help wilt greens. Serve over warm rice. So warm, so comforting, so nutritious. Delish. 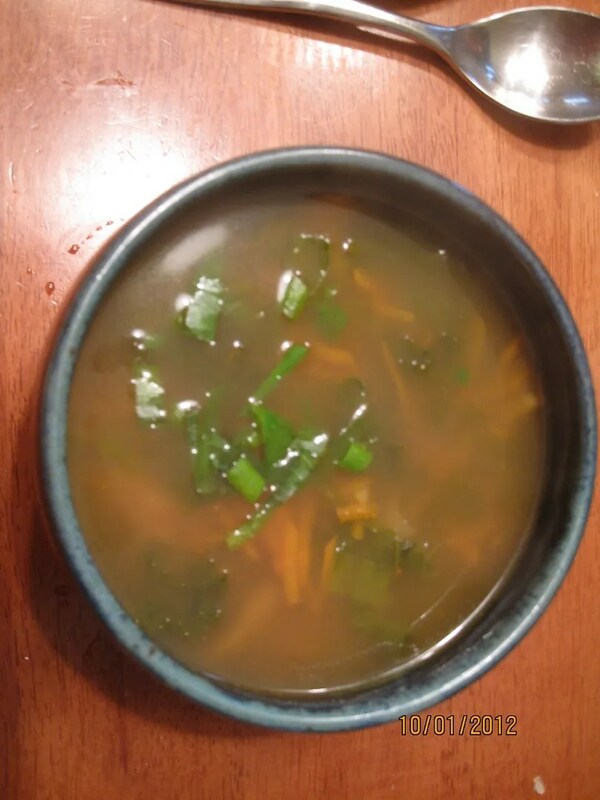 Brrrrr….. How About Some Soup? It’s ridiculous outside. We’re having soup. In case you’d like to do the same, but aren’t sure what kind to make, check out our Soup De Doo, a roundup of our favorite Pantry soups. I’ve got Vegetable, Bean, and Barley Stew working in the Crock Pot and it smells fantastic. What are you doing to keep warm? Prep Notes: When chopping the jalapeño, I STRONGLY recommend wearing gloves, or putting plastic bags on your hands. This advice is particularly important for those of you who wear contact lenses. Yes, this is the voice of experience. OW. To chop fresh ginger, I use the edge of a knife blade to slide the skin off, or I cut if off if that doesn’t work. For the mushrooms, yes you really DO want to de-stem because the stems are quite rubbery. Most people who don’t like shiitake mushrooms, don’t like the stems. If you’ve got a microplane, use that bad boy to zest your lemons. There. Moving right along. 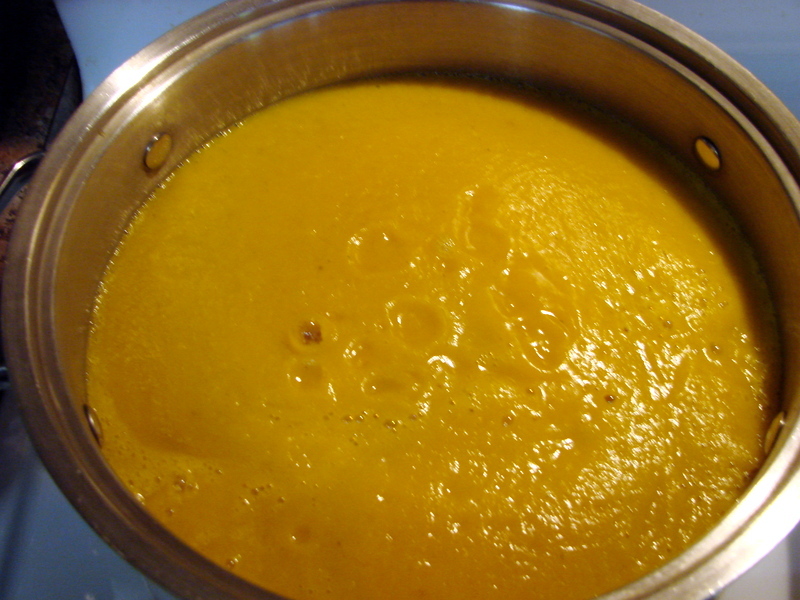 Warm oil in a soup sized pot. Just higher than medium should do it. Add the jalapeño, ginger, and garlic. Saute for about 2 minutes. 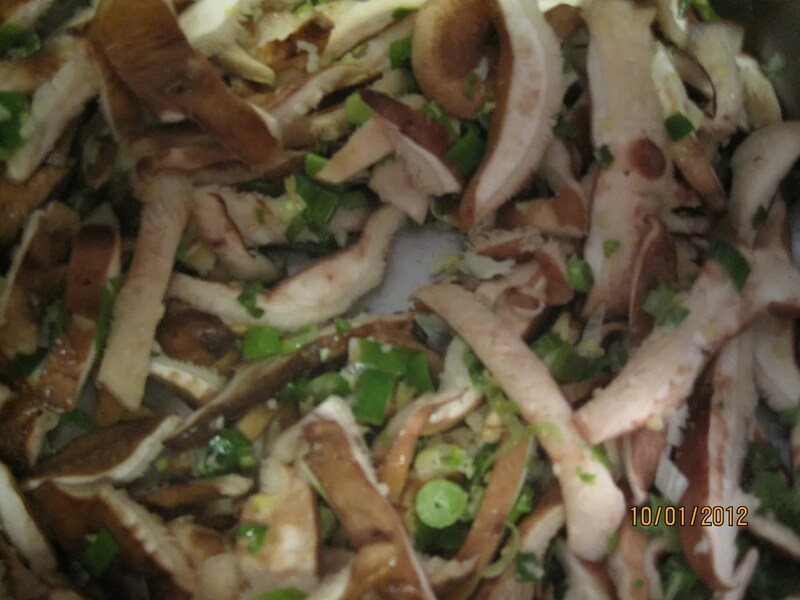 Add mushrooms and scallions. Saute for a few more minutes, being sure to give the mushrooms enough time to soften. Add your stock and soy sauce, bring to a gentle boil and cook for 5-10 minutes to allow the soup to reduce a bit and for flavors to mingle. Add kale, cook for about 2 minutes. 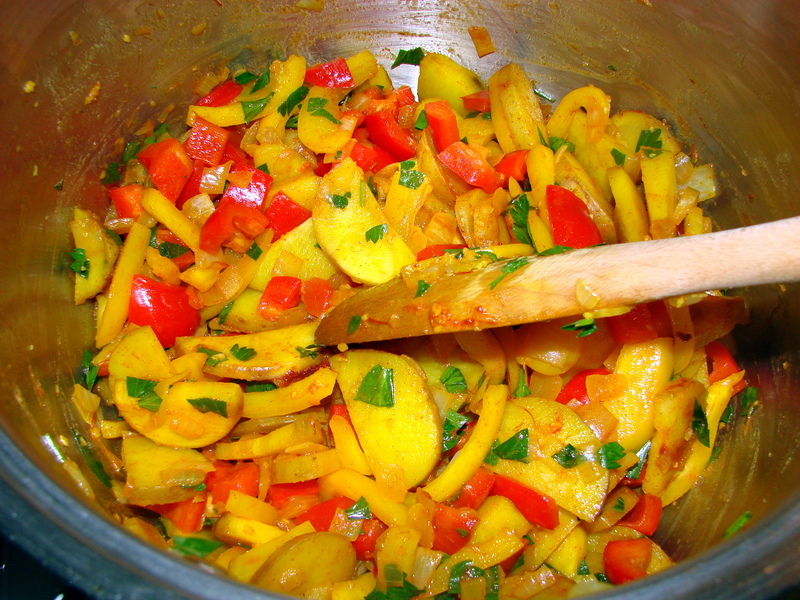 Add lemon juice, zest, and carrots. Cook for two minutes longer. Add black pepper to taste. Done. 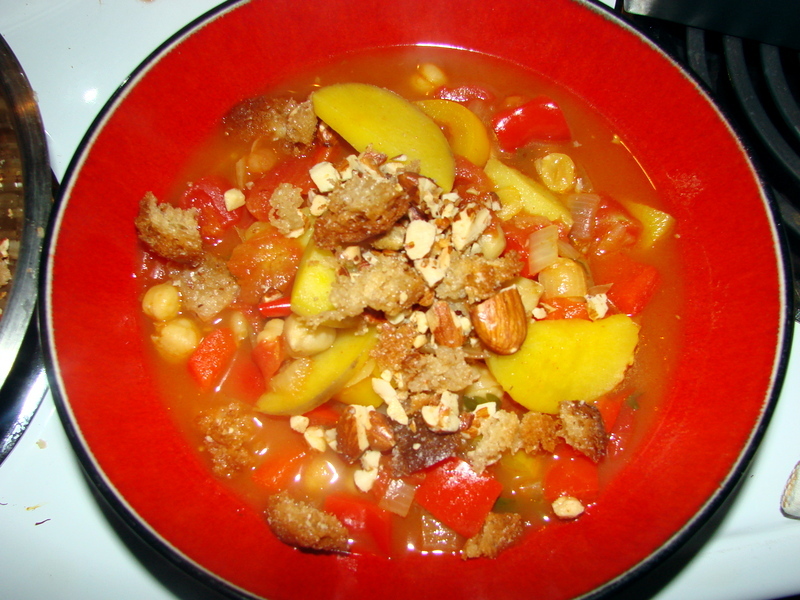 Serve in favorite bowl with giant spoon. Really? That’s it? That’s all to the story? Of course not. I didn’t tell you about the rest of the table…. because of course there was a rest of the table. I am generally a pretty tough customer about having my children try new foods. 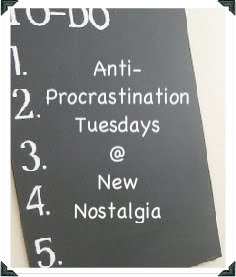 We have a rule, borrowed from Big Sis, two real bites of whatever is new. 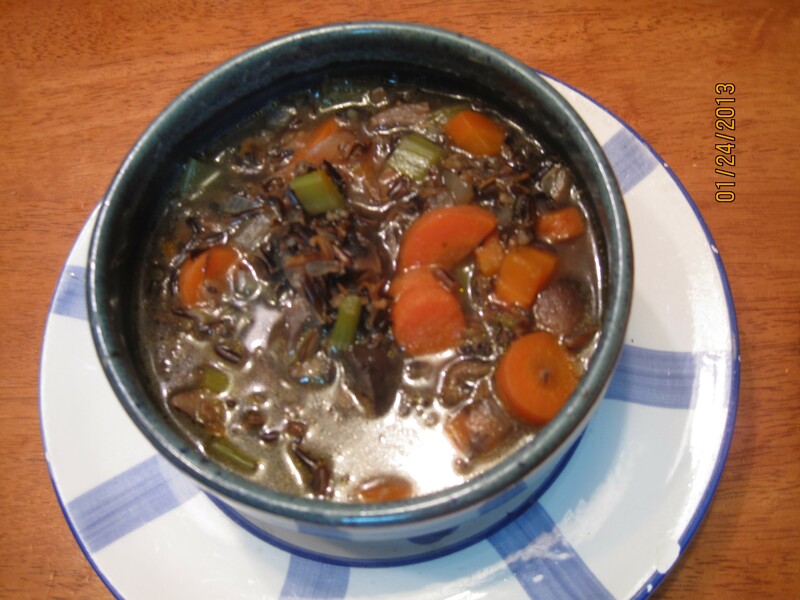 As I was making this soup, and remembering sweating while I ate it last year (last year’s pepper was far more potent), I realized that little miss was going to have an issue. And that while I might be able to convince her to try it, she would not be eating it. I was right (it is nice to right once in a while where she is concerned), and so it was lovely to have on the table a big bowl of brown rice that we sprinkled with rice vinegar with a splash of maple syrup to give it that sushi rice taste (inspired by Big Sis’ sushi salad), and some broccoli I grilled with olive oil and soy sauce, thanks to my good friend at Emmy Cooks. A bowl full of farmer’s market green beans (raw, yum), and the last of the chickpea nofu (I’m working on the recipe, I promise), and we had a pretty happy crowd, a pretty happy crowd with less chest congestion to boot. Delish. 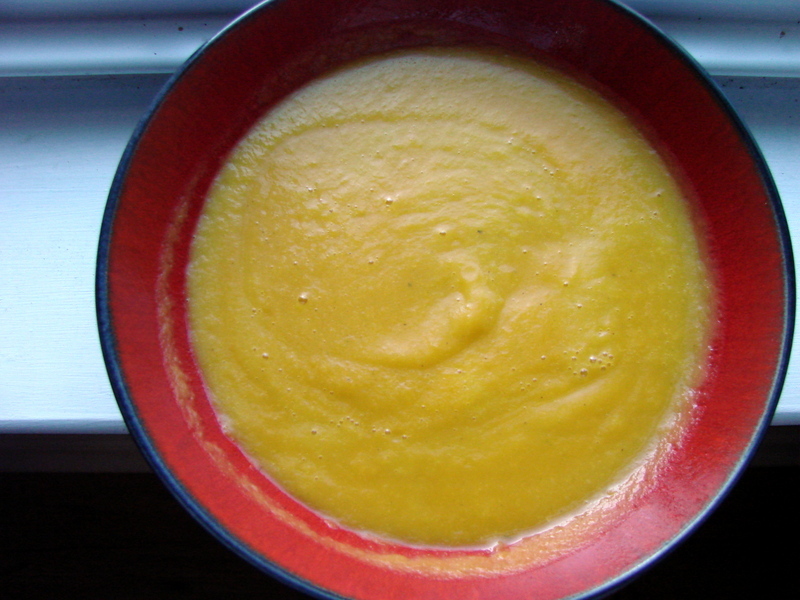 If you haven’t had butternut squash soup before, then this is the time and the place my friends. Fall brings somewhat reasonable prices to the glorious elongated globules of goodness and this is a very easy way to make something that your family and friends will think took a very long time. Don’t you love that? First off, I hate peeling squash. Too many corners… peels too tough, and many of you already know that I have an aversion to peeling. So I roasted, let it cool and scooped instead. 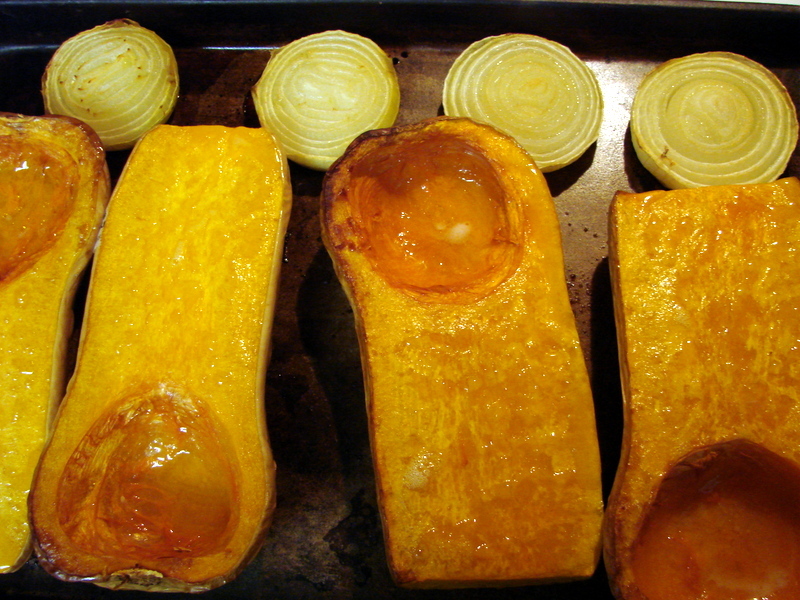 Here’s the squash before roasting…. 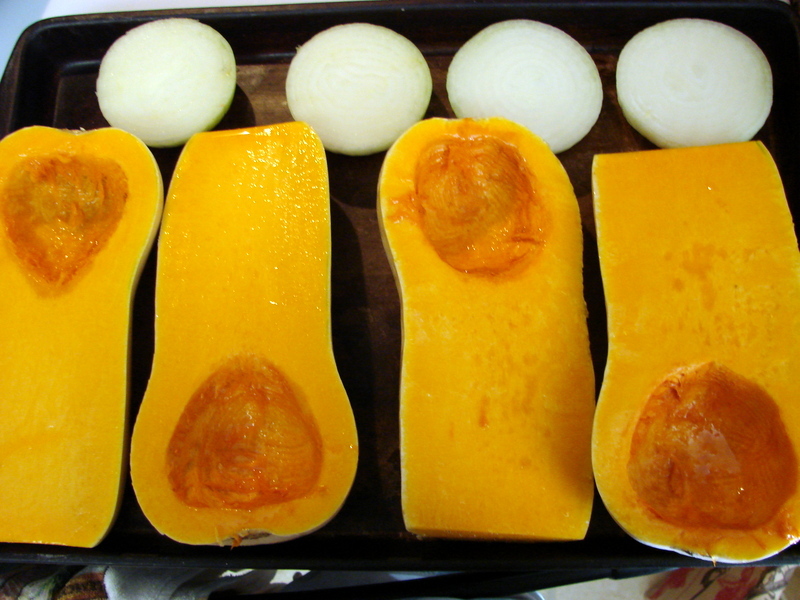 Simply cut 2 butternut squashes in half, scoop out the seeds. 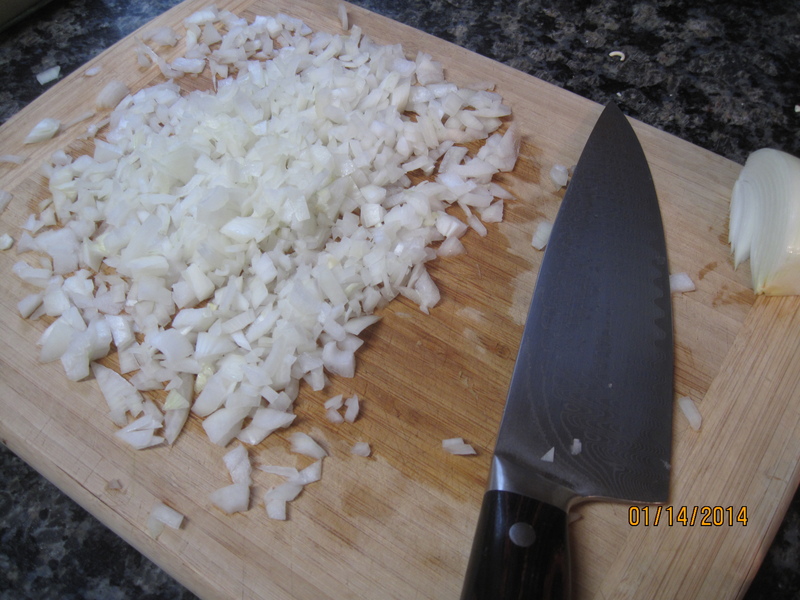 Peel and then cut 2 onions in half and brush them all lightly with your favorite oil. I brushed the bottoms of the onion and the tops of both. Place on a baking sheet and in a 375 degree oven for about 45 minutes. I confess this is an estimate. You want the squash to be soft. This can be done ahead of time. Let the squash cool to the point where you can pick it up – or if you’re like me, until the point where patience is no longer functioning and the asbestos fingers inherited from Grandmother Lillian come into play, along with just a little swearing under the breath… which was not inherited from Grandmother Lillian… and scoop out that gorgeous flesh and into a bowl for later use, or right into the high speed blender, or a pot where you can use an immersion blender. 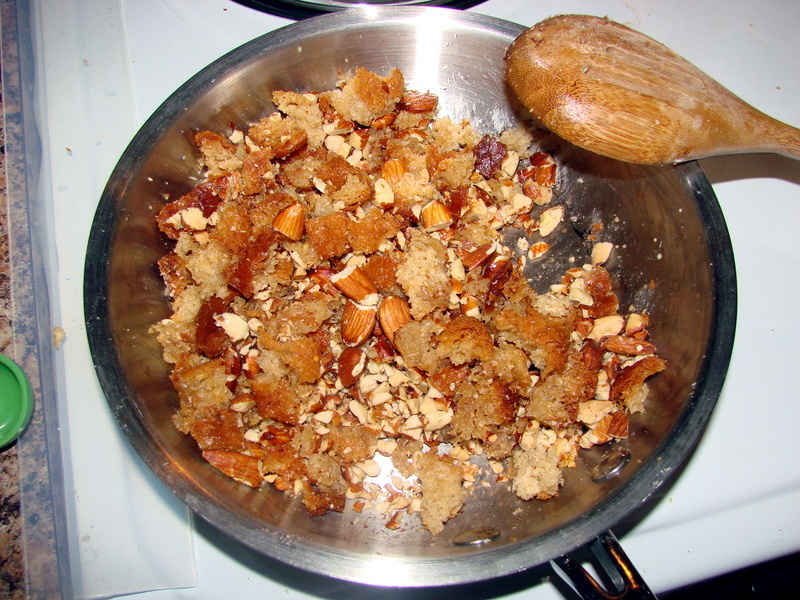 I do not have an immersion blender and have not tested this recipe, so user beware! I am blessed with a 12 year old Vita Mix. in the Vita Mix. I poured out one blender full into a pot on the stove and then repeated. Oh man is this stuff good. My 11 year old who is a devoted hater-of-squash ate it. It wasn’t his favorite, but hey, we can’t have our favorite all the time, can we? It builds character to suffer through Mom’s favorite once in a while, don’t you think?